Arturo Criado, a journalist at Spanish financial magazine Capital, has commissioned an article from me about the Spanish monarchy’s use of social networks and how an such an institution could make the best use of a medium with huge communication potential, but that is still regarded with a certain amount of fear and mistrust. 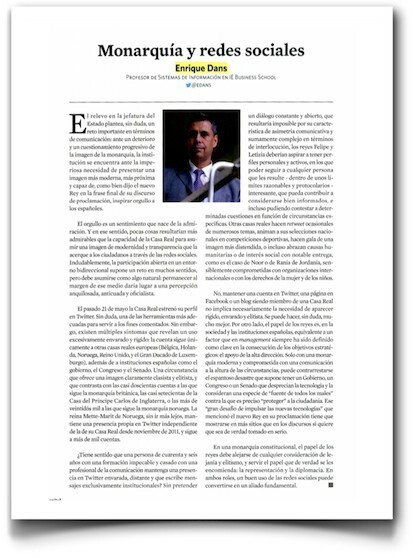 The title of the article is “Monarchy and the social networks” (pdf in Spanish). In writing the piece I compared how other monarchies use tools like Twitter or Facebook, as well as the extent to which communication was uni- or bi-directional, the amount of followers they had, the amount of retweets and replies they generated, personal vs institutional use, etc. It was an interesting exercise, allowing me to assess different approaches between monarchies, whether classic, rigid institutions that would have a single, official account; compared to other, more informal or more dynamic royal houses that might be more direct, with many personal accounts, and in some cases informal communication formats. King Juan Carlos’ abdication in favor of his son Felipe presents some interesting challenges as regards the Spanish monarchy’s communication strategy: after several years of declining popularity, the institution urgently needs to come up with a more modern image, more in touch with the times, and as the new king closed his inauguration speech, one that might inspire pride among Spaniards. Pride is a feeling born from admiration. And the Spanish royal household is to be admired for taking on an image of modernity and transparency, aimed at bringing it closer to the people, for example through the social networks. Without doubt, open, bi-directional participation presents many challenges, but needs to be accepted as a stage in a natural process: remaining outside the social networks would have given the impression of an out-of-date, moribund, and officious institution. On May 21, the Royal Household opened its first Twitter account. This is without doubt one of the best tools for the goals outlined above. But there are already signs that it is being used overly rigidly: the account only follows other European monarchies (Belgium, the Netherlands, Norway, the United Kingdom, and the Grand Duchy of Luxembourg), along with the Spanish government, Congress, and Senate. This gives the image of an elitist institution, and contrasts with the almost 200 accounts that the British Royal Family follows, the 700 that Prince Charles follows, or the more than 22,000 that the Norwegian Royal Family follows. Queen Mette-Marit of Norway has had her own Twitter account since November 2011, and follows more than 1,000 accounts. What is the sense of a 46-year-old man with a top-level education married to a former journalist having a Twitter account limited to formal announcements? Nobody is suggesting that either Felipe or Leticia are going to be chatting one-to-one on the social networks, but they should certainly have their own accounts and be able to follow anybody they think has something interesting to say, and that under certain circumstances may even be able to address specific issues. Other royal households send out occasional retweets on different subjects, encourage national sports teams, and try to give an impression of informality, embracing humanitarian causes, such as Queen Noor of Jordan does, or for example supporting human rights organizations. In the case of royal families, having a Twitter account, a Facebook page, or a blog makes no sense if they are simply going to give the appearance of being elitist, rigid, and out of touch; they can be so much more. The monarchy can fulfill the same role in society as senior management in a company in attaining strategic goals. Only a modern, engaged monarchy that knows what is going on can do something to counteract the disaster that a government, Congress, and Senate that believes that technology is a force for evil, the effects of which the electorate needs to protected from at all costs. This “great challenge to drive the growth of the new technologies” that the new king mentioned in his speech needs to manifest itself in more places than speech podiums if it is to be taken seriously. In a constitutional monarchy, the king or queen cannot afford to be seen as distant or a member of a tiny elite; he or she must carry out the role that they were entrusted with: diplomacy and representation. In both cases, the right use of the social networks can be a fundamental ally in that task.